Society as a whole is starting to realise that water is becoming a larger, or perhaps our largest, sustainability problem. While previously it was the lack of water that was perceived as the problem, in the last few years we have clearly noticed problems with water abundance – in the form of floods, rising sea levels and changing weather conditions. However, quantity of water is not our only problem. We are also seeing increased water pollution due to effluent and run-off to surface and ground-water, and the now-familiar “plastic soup” in our oceans, creating hazards and risks to our water resources and associated natural resources. These threats to earth’s water sources make good water stewardship more important than ever before. The Alliance for Water Stewardship (AWS) is offering a standard to start or improve your water stewardship and comply on a core, gold, or platinum level. With influential members such as Olam, P&G, Phillip Morris International, CDP, Natural Capital Coalition, Diageo, ERM, Coca Cola, and of course Ecometrica, AWS has gained traction worldwide as the global standard for Water Stewardship. All these companies and organisations recognise the importance of good water stewardship to ensure business continuity. Water is perceived as a common pool resource and therefore very vulnerable to what is commonly known as the ‘Tragedy of the Commons’, where water itself is not priced; instead we pay for the supply infrastructure and distribution. As a common pool resource, actors in the same catchment area are competing for water from the same source while none of them take responsibility to maintain that source. This often leads to unsustainable practices. At the same time, actors have a shared responsibility to mitigate the detrimental effects on their catchment areas and should collaborate to undertake action. The AWS recognises the importance of water stewardship being a shared effort between multiple, sometimes competing actors. Moreover, the AWS standard fits perfectly within any management standard using the well know PDCA approach such as the ISO9001 and ISO14001 standard that many companies already have in place. When implemented the AWS Standard provides you with a water consumption and disposal that is socially equitable, environmentally sustainable, and economical beneficial, achieved through a stakeholder inclusive process and site and catchment-based actions. The AWS standard is founded on six steps (fig 1). Ecometrica’s water risk assessment focuses on the effect an actor can have on the water resources in a catchment area or if there are specific risks to the actor. While the quantity of water is mainly assessed, the quality of affluent into a catchment area is an important measurement for actors to include in the risk assessment. The water risk assessment is currently based on three water datasets; Overall Threat to Human Water Security, Overall Water Risk, and Global water depletion. With these data sets an actor can determine the social and environmental risks it poses to a catchment area and can determine if there are risks for that actor’s business continuity caused by the sustainability situation in the catchment area. However, the scope of such risk assessments is often increased by adding various other data layers such as biodiversity, landcover, population etc. Direct and indirect water consumption; the amount of water needed for the product and the overall operations. Water consumption; the amount of water consumed from the municipal water supply, but also from sources such as, fresh water, ground water, salt water, and precipitation. Water withdrawal by source; such as catchment area, water basin, or aquifers. Chilled and warm water supply; the amount of water supplied by energy providers for district heating and cooling. Waste Water treatment; the volume of water being treated before being released onto surface water. Water Recycling; the amount of water recycled onsite to be reused in onsite processes. Water cost; usually the price paid to the water company supplying the water, but actors can set their own sustainable water price to determine actual cost and compare to market cost. Often these data sets are recorded as part of a bigger assessment, usually a Greenhouse Gas Assessment, but can be analysed separately. The water footprint assessment allows actors an easier and less time-consuming way to determine the complete water footprint of their products. While the tool is mainly focusing on agriculture, since 80% of our available fresh water is used for the agricultural sector, developments to broaden the scope of the service are underway. 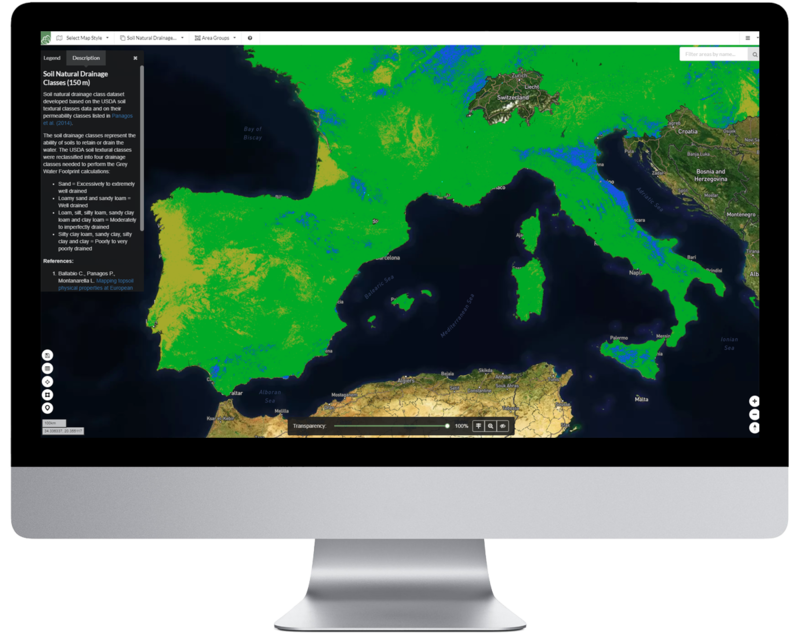 The water footprint assessment service relies on a large amount of data from a variety of sources to determine the Blue, Green and Grey water footprint. Data sources used for the water footprinting service are; models to determine the spatial and temporal water requirements per crop; geo-spatial, maps and satellites to determine spatial and temporal features of the area, such as soil type, precipitation, erosion potential, and so on; data from our database on pesticides, contamination, and water quality, amongst others; but also client specific data like the type of pesticides used, the application rate, or management practises. With the combined data from these various sources we can accurately determine the Blue, Green and Grey water footprint without actors going into the ‘field’ to collect the required data. Ecometrica is here to help you. Check out our range of off-the-shelf products to get you started with assessing your Water Footprint. Or, if you’d like to talk more about the AWS Standard and how to complete your first assessment, contact us now.